Who would have thunk it? That an innocent scrap of mustardy-yellow, furry trim-stuff could instil lie-awake-at-night blind terror? Scared out of my wits from the start but a sucker for this sort of thing, I signed my name on the dotted line for Gemma’s birthday Loz and Dinny Challenge. I’ve decided to be pretty chuffed with myself. There was great relief with a sort of spur of the moment notion, a dash to the trusty Amitié and the same evening, I made a tote-thingy. No pattern, made-up-as-I-went, fully lined and of course I ran out of fabric. So don’t go looking for any pocket whatsit, although there is a gusset (awful-est word in the English language) and those bits of side trim are hiding a couple of seams for the extra fabric bits. I thought I was too clever by half, twirling that trim into flowers, until I saw a way lovelier take on the floral over here. I know who I reckon should win (cos there’s even a prize, see). Super Pops is one lady up for a challenge. While I prance about with my sissy bag, she’s off saving the world with her bit of mustard trim, working for good and not evil, (discounting the fact that lately she’s been consistently causing me to fall off my chair laughing). PS. Big HAPPY BIRTHDAYS to that sweet lady who so knows how to make the bloggy world sweat. The sleep deprivation has been worth it - that is an awesome bag. The material is beautiful but the floral trim embellishments are truly inspired. This is a super challenge - I am really enjoying seeing what you've all come up with. SOOOO FAB!! Me loves muchly. With a bag like that...you should feel very chuffed. Love it! That bag is superb! And can I just say again how jealous I am of your proximity to Amitie ... that fabric is divine! Great tote'n'fringe work there! I love the shape of the bag, the twirl of the fringe and, well, the cut of your gib really. You have made fringe magic. Wow wee! This is a bit of a hot tote! My god - you've made the fringe look as if it just came appliqued! Are you trying to make the choosing of a winner difficult? - the stress of it is going to cause me irreversible kidney failure. On ya, Mrs! Fabulous! I love your use of the trim. I love it ! Very stylish and the colours are gorgeous . P.S. The nastiest word in the English language is MOIST . absolutely FAB-O, what a gorgeous bag! 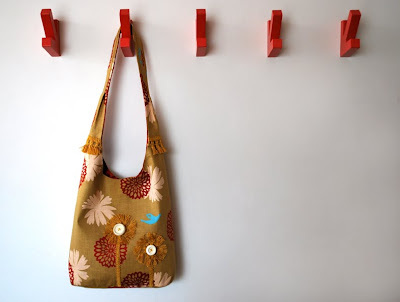 It is so fun to see how the same unatractive piece of trim was made nto a beautiful/fun creation... and all so differents!Love your bag great job Tania! Tania, that's gorgeous. I mean, utterly gorgeous. You have such a great eye for cool fabrics too... perfect. Love the flowers. Feeling envious that I did not think of making something cool for MYSELF like you. Hey your bag looks brilliant, I am a huge...HUGE fan of echino.....and miss pops made me piss my pants!!! Oh wowee that bag is absoltely gorgeous! Who knew that you could actually buy fabric that complemented the vintage gold trim. Great style and shape and I love the applique! Your bag is beautiful! You should totally win!!! I'm a knitter, but don't sew, and am continually amazed by the gorgeous things seamstresses can create - without a pattern, no less! Way to go! Oh wow, that looks great! A definite prize contender there! oooh I LOVE your bag it is sooo gorgeous!!! You have made some pretty average looking trim into something beautiful. You are very clever how you can see into the future, into what is possible. I love your bag! The wonder woman costume is hilarious. That's awesome, I'm so impressed by your use of the trim. Wow what an absolutely gorgeous tote! The colours are looking fabulous together. 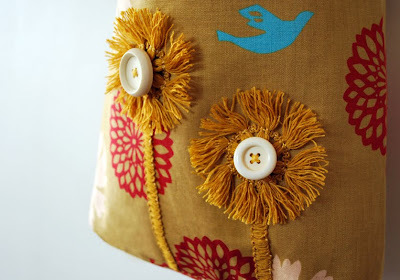 I love the button detail in the little twirled flowers - I couldn't think past straight lines of trim. Who would have thought that a bit of mustard fringe could look so stylin' !! Once again you've impressed and inspired me! 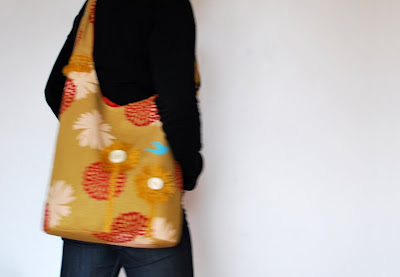 Love, love, love that tote - which is just perfect with that trim. DON'T VISIT MY BLOG. You will see a preview of the parcel we are posting tomorrow. We had to check with Aussie customs on some items. It's all good though! Cute bag. I love what you did with the trim. Very lovely!